Nacra 36C Carbon Catamaran: cost effective speed. Nacra 36C Carbon Catamaran: cost effective speed. Maximum knots of speed for dollars spent! REDUCED TO SELL, IT WAS A BARGAIN, NOW IT IS AS LOW AS IT GETS. HOWEVER I WILL ACCEPT A REASONABLE OFFER JUST TO KNOW WHERE I STAND FOR THE NEXT SEASON/YEAR. Great value at the cost of just the recent refurbishment. Sail at 30 knots plus and consistently at 25 knots for outstanding racing performance. Your chance to win the Australian Multihull Nationals or just go fast. Even just two sail reaching we have hit 29 knots, so you can keep it simple and cruise fast and enjoy the thrill of speed. No other boat can offer the value ofor speed and ease of sailing that Catalyst can. $77,000 Australian is just US$55,938 or 49,000 Euro at current day rates. Overseas buyers are currently interested in transporting the boat on the custom made trolleys in a 40' container. No matter where this sails it will be an attraction, a real head turner but most importantly it brings the fun back to sailing with great ease at a very modest cost. 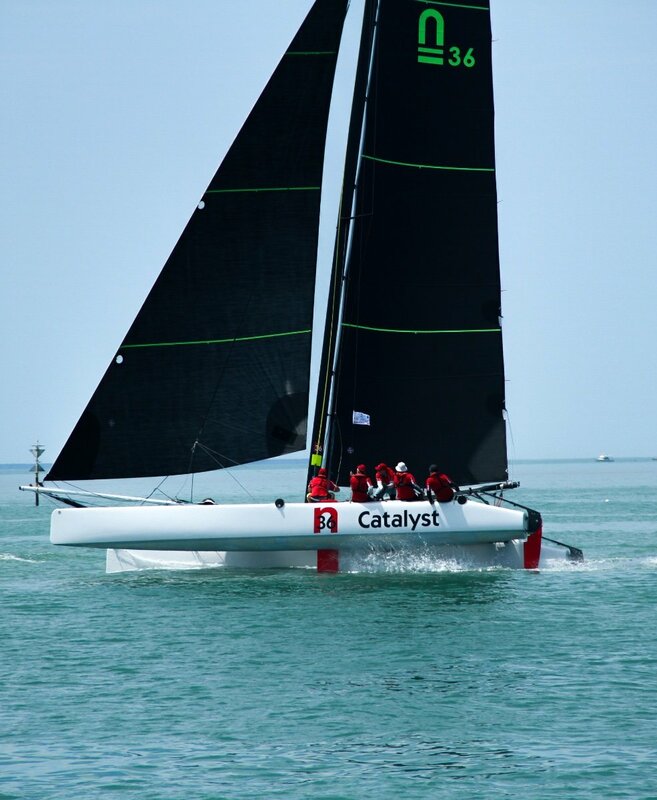 Catalyst is a racing catamaran which it is a delight to sail. Light to helm and well balanced to sail fast in all conditions. Built by the Brisbane Catamaran Centre, it has undergone significant refurbishment in the last two years, following a detailed engineering analysis which resulted in a new carbon two part prodder with stainless steel rigging and bracing, with new rigging to the beautiful two part rotating Hall carbon mast and carbon boom. The new central pod accommodates the new 15 HP Yamaha outboard, fuel tank, rope bags and all new electronics including VHF radio, depth sounders in each hull, B & G Zeus 2-7" chart plotter with GPS that has 4 remote displays (currently used for bearing, speed, bearing to next mark and velocity made good) and navigation light controls. The B & G can be operated from an iPad or telephone using the wi fi system. It also has new efficient dagger-boards and rudders to balance the boat and reduce drag. There are full two sets of Ullman sails. The new racing sails include a large square top main, self tacking jib, upwind screecher and Code 0, both on furlers. The jib has a new external halyard lock and the main has a halyard lock within the mast. With the ultimate VC Offshore antifoul the boat can be kept in a marina. Currently it is stored in a marina berth at RQYS in boat bags. Alternatively, it could also be stored on the purpose built aluminium trolleys which after de-rigging can be lifted onto the purpose built trailer (the trailer is available to Australian buyers as it will not fit in a 40" container). The trailer has storage for all the equipment and spars to make the boat trailable. There is a photo of the boat prior to the upgrade on the trailer and one of the trailer with the mast in its protective cover. The trailer has a winch and tackle to enable the trolleys to be lifted onto it. The main, screecher and code 0 sheeting systems have been completely redesigned to enable them to be quickly operated using the 3 Harken winches on each hull or the 4 on the pod that enables sheeting for a variety of conditions and facilitates sail changes with perfect sail peels from screecher to code zero and vise versa. This ensures that this lively boat can be easily controlled in all conditions. The main beams are round anodised aluminium to ensure stiffness and the trampolines are new spectra open weave nets to minimise windage to create a safe platform for working or relaxing. There are lazy jacks and mainsail bag with two (one spare) boom tents to cover the boat. There are also 5 crash helmets and life jackets and Catehgory 5N safety gear together with various spares. Cost discounted for collection as is at RQYS, Manly, Queensland. For overseas buyers there will be transport costs in a 40" container and additional costs for dismantling the boat, loading into a container, transport to the Port of Brisbane and Port of Brisbane costs. However, these costs are relatively modest. Boom lazy jacks and two boom covers.